First off, the concept of this is obviously amazing. A world where no one can die naturally and have to be killed off (gleaned) by people specially chosen for the job, who can’t actually want to be Scythes because otherwise the world would be run by psychopaths. I really loved the world building as well, it was so intricate, you have the Scythes and their whole political system, all the different methods of gleaning, the whole AI system which is kind of like The Cloud, everything about it was really well thought out and interesting. The only thing I could slightly complain about with the world building is that it doesn’t really deal with natural disasters, like okay this is a perfect world, but how do you eliminate flooding, earthquakes, hurricanes etc. Shusterman kind of touches on this with fire, but I wish he’d expanded a little on how the other natural methods of dying were dealt with. I also love that Shusterman’s novels always deal with some kind of big philosophical question but are never heavy handed about it. This one is obviously dealing with the moralities of death and killing but also the consequences of what would happen if we lived forever, would humanity just become useless because we don’t have the fear of a natural death forcing us to strive and achieve? It’s all very interesting, and Shusterman explores all the possible facets of his perfect world. I did feel like the morality conflicts could have been slightly better in this book, whereas in Unwind, everyone is pretty morally grey, in this book the distinction between the heroes and the villians were pretty stark. The pacing was a little off throughout the book, it’s only really after about chapter 17 that I really started to get into the story and the stakes started to feel a little higher, for most of the first couple of parts of the book it kind of felt like it was just gliding along, not really going anywhere. The chapter lengths were for the most part good, although there were some that were overly lengthy, particular in the parts of the book that dealt with the conclaves (Scythe meetings). I also felt like it took a bit longer than it should have to get to the whole winner of the Scythedom has to glean the loser thing, given that it’s told to you in the blurb of the book! I loved the named chapters! It’s such a small thing but it really makes a difference for me, I love it when authors take the time to give the chapters names, it’s just a little extra detail that helps me get even more into a book. It was kind of weird for me that the acknowledgements were at the front of the book, I mean it doesn’t really make much difference, it’s just that most YA books have the acknowledgements at the back so it was slightly jarring having them first. 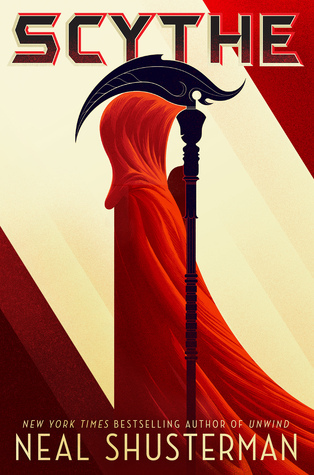 The scythe journal entries between each chapter were awesome, they just added that little something extra to the book which I liked. It took me a while to warm up to the main characters Citra and Rowan, I felt like you didn’t really get to know them much when they were together and it was only when they were apart that you got to see their true personalities shine through. I also felt like the whole one of them having to kill the other made less and less sense as the book went on, with every twist, it started to seem more like a formality than something actually to be feared. I initially liked Citra more, she was bold and inquistive and was always asking “Why?” something had to be done, but I actually found Rowan the more interesting of the two by the end, because he actually had to struggle morally, between whether gleaning was right or wrong and if it should be enjoyed, due to who his Scythe mentor ended up being, so his story actually became more interesting to me than Citra’s. Citra kind of gets off easy, as she gets a Scythe mentor whose views very much match hers, so she doesn’t have to struggle as much morally as Rowan does. I hope that they both get developed more as characters in the next book, because that did feel like it was lacking here. I thought the mystery with Scythe Faraday was a little simplistic, I worked out what was going on basically as soon as it was introduced, so it was kind of a waiting game to see when you knew what was going to happen was revealed. I did appreciate that the mystery allowed Rowan and Citra to diverge though and develop separately. The romance I felt was very flat and really unnecessary. It would have been more believable if Rowan and Citra had formed a real bond as friends and that’s why they didn’t want to kill each other, but the romance was just forced, because honestly there was zero chemistry there. The writing was good, but a little dense at times? Still there were nice moments of humour in there, which were much needed to lighten the mood. I did love seeing all the different Scythes, and how no one Scythe seemed the same as the others, even the ones who had similar ideas on gleaning went about it in different ways. I particularly liked Scythes Curie and Faraday. The ending in particular was very strong, and has me incredibly excited to see where the next book goes. Overall, this was a decent book, it struggled with pacing at times and the character development could have been much better than it was, but the world development and the amazing concept definitely prevailed in that I still really enjoyed this book despite what would usually be pretty massive weaknesses for me and that I cannot wait to read the sequel when it comes out next year! The next book I will be reviewing is Scott Westerfeld’s Afterworlds. In the meantime though, I will have my October #RockMyTBR Update up very soon!